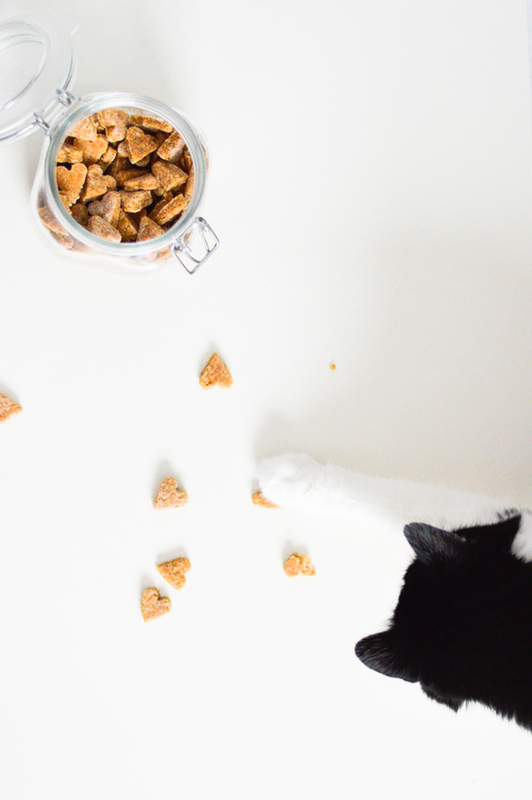 Make these homemade chicken treats and your pets will love you! I’ve wanted to make my own treats for a while now, to see if the girls like them more than the ones I buy at pet shops. And they do love them more! I made little hearts, because Valentine’s day is just around the corner and this is my way of showing them that I love them. I think they know that anyway, but a special treat like this one makes things more fun. Kim was going crazy once she realized that I was cooking some chicken in the kitchen. She kept crying behind the door. But it was all worth it. This is a simple recipe and you don’t have to be a skilled baker to do this. If you have more chicken breast on hand as you make this, my advice is to cook it all and then give the extra chicken (that you don’t need for the treats) to your cat (or dog). From my experience, cats LOVE cooked shredded chicken, mixed with water the chicken was cooking in. As you can see, the girls just loooove them. Recipe makes about 100 really small treats. Rinse with water and cut away any fat/skin. Put in a pot and cover with cold water. Bring to a boil, lower the temperature to medium-high and let cook until it’s soft (when you can stick a fork in it). Remove the pot from the heat and let chicken cool to warm room temperature. Preheat the oven to 180°C (350°F). Cover a baking sheet with baking paper. Take the chicken out from the water (but save the water) and shred it with a knife and a fork (or any other method that you like). In a bowl, mix together the chicken, water and margarine (you can warm it up in the microwave to make things easier). You don’t need a mixer for this, just use a fork. In a separate bowl mix together the cornmeal and flour. Once you’ve formed the dough, slightly flour your working surface, transfer the dough on it and knead for a few seconds. Roll it out to about 0,5 – 1 cm (1/4 inch) thick. Cut out your treats in any desired shape and place them on the baking sheet. They can be placed close together, as they won’t get bigger during baking. Bake for 20 minutes in the center of the oven. 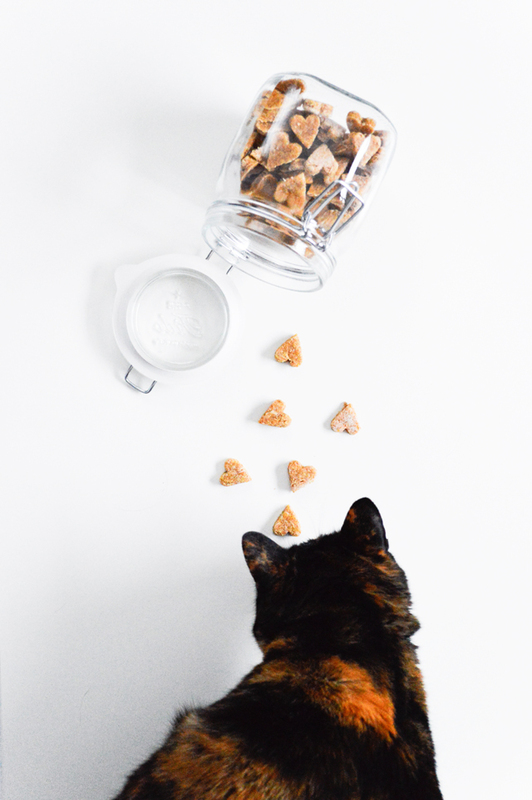 Let them cool for about 10-15 minutes before your kitty or pooch try them! 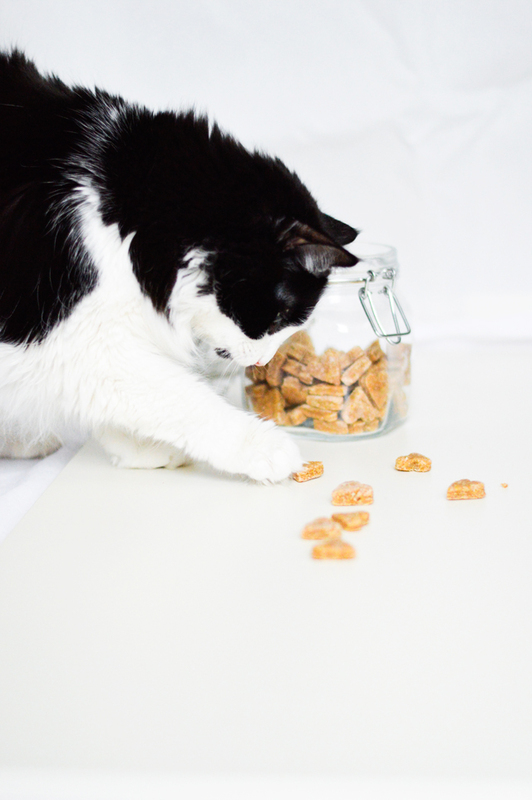 Treats are chewy and easily breakable. Keep them in an airtight container in the refrigerator (or leave them out, but use them in 3 days).